Ranch dressing is easy to make from home with this simple method. It is the BEST RECIPE and EVERYONE will want it! Ranch Dressing always seems about a billion times better when you get in in a restaurant than when you buy a bottle. I don’t know what they do to the bottled stuff to zap all the flavor out of it, but I recently decided enough was enough and set out to make my own homemade version. My recipe comes together in minutes! We like it on salad recipes, of course, but homemade ranch dressing really shines as a dip for southwestern egg rolls, fried pickles, and taquitos! Mayonnaise – Please, use real mayonnaise! This is not the place for Miracle Whip! Sour Cream – This is what adds that luscious tang in the dressing. 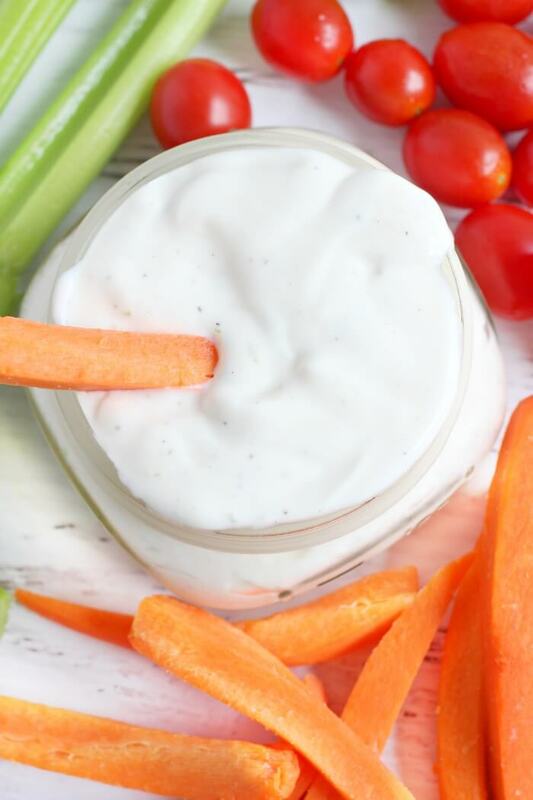 Buttermilk – This ranch dressing recipe calls for a small amount of buttermilk – but did you know, buttermilk can be frozen so you always have some around when you need it! Or, if you just want to use it all up at once – check out my awesome collection of Buttermilk Recipes! You’ll have treats for days! Olive Oil – You may want to go with a lighter olive oil so that it doesn’t impart an olive taste to the finished product. Lemon Juice – Did you know that microwaving a lemon for 20 seconds will release the juice better!? Garlic Salt – Using the garlic salt adds just enough salt with a great garlic flavor. Dried Chives – Dried chives give the dressing those special green flecks! Onion Powder – Like the garlic salt, the powder imparts flavor without chunks of vegetable, so you keep that smooth, creamy consistency. Pepper – You could use white pepper if you don’t want the black pepper flecks. Personally, I think the black specks add a nice touch. First, combine ingredients in a food processor or blender and blend well. You can also use an immersion blender (my personal choice). ★ Make sure to check the dates on all your ingredients and make a note on your dressing jar so you know when it expires. ★ Always use full fat mayonnaise, sour cream, and buttermilk for the creamiest and best tasting dressing. ★ If you don’t have buttermilk, make some by combining 1 tablespoon of white vinegar or lemon juice plus enough milk to measure 1 cup. Ranch dressing is an emulsion of mayonnaise, oils, and spices. It is commonly used as a dressing on salads, as a dip for vegetables, and even as a drizzle on pizza and casseroles. Ranch dressing is called Ranch because it was actually created on a ranch! Steve (Kenneth) Henson perfected his buttermilk dressing with the addition of various herbs and spices until he came up with a recipe he liked. Mr. Henson served his dressing to visitors to his dude ranch, Hidden Valley Ranch (ya see where this is goin’!) in California. Eventually, the dressing made more money than the dude ranch, and Mr. and Mrs. Henson perfected a dried mix that was sold all over the country. Since the 1950’s, this dressing has become America’s favorite dressing flavor. Thanks, Mr. Henson! Ranch dressing sometimes contains eggs in the ingredients, but our recipe does not call for eggs. This recipe calls for mayonnaise, which is the combination of oil and eggs. 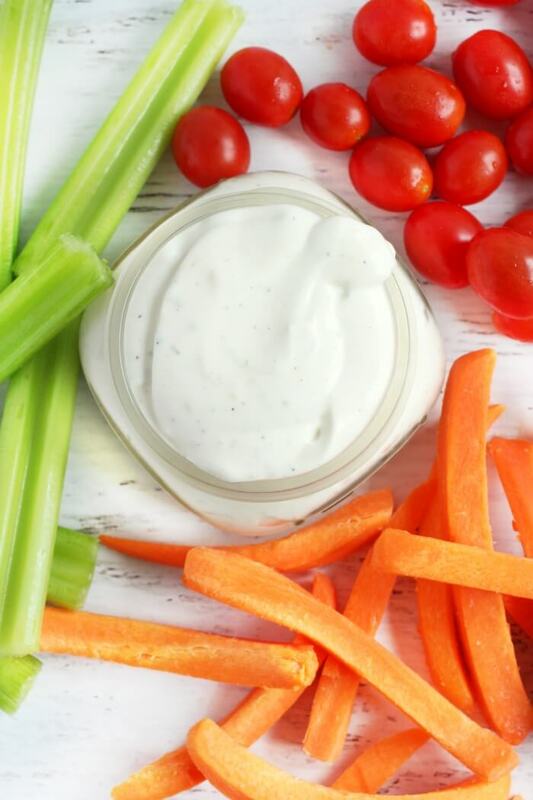 Ranch dressing has some carbs, typically in the area of 2 grams per serving. Most bottled dressings contain sugar which increases the carb count. My homemade version contains no sugar so the carbs are coming from the natural sugars in the dairy products as opposed to added refined sugars. 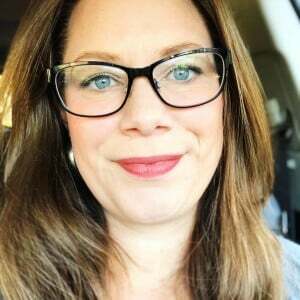 Ranch dressing can be considered keto when made with whole fat dairy. Fat-free versions of store bought dressings are fairly high carb so avoid those! This is because when fat is removed from a product, sugars are often used to try to replicate the richness of the recipe. My recipe is made without sugars so a small amount should be fine for keto dieters. Ranch dressing should be fine in pregnancy (always confirm with your OB as your particular situation may differ). Caesar dressing, which often contains raw egg, is usually restricted. 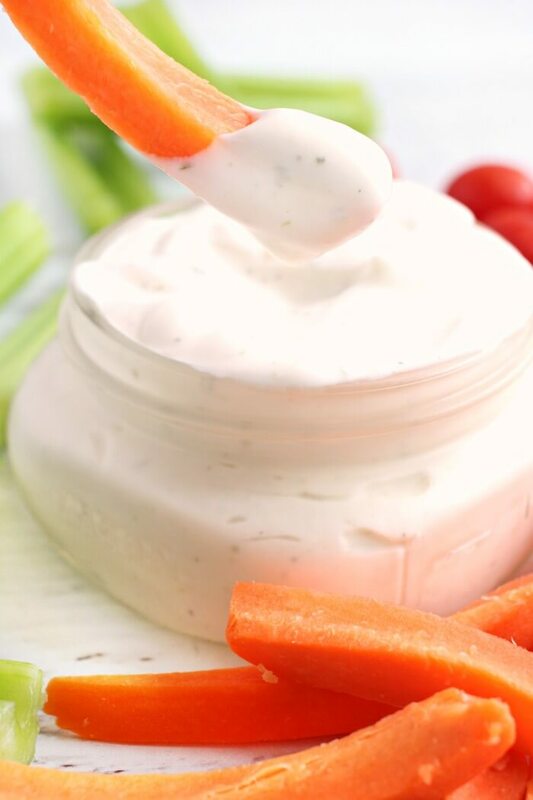 To make ranch dressing thicker you can stir in additional mayonnaise until you get the consistency you prefer. 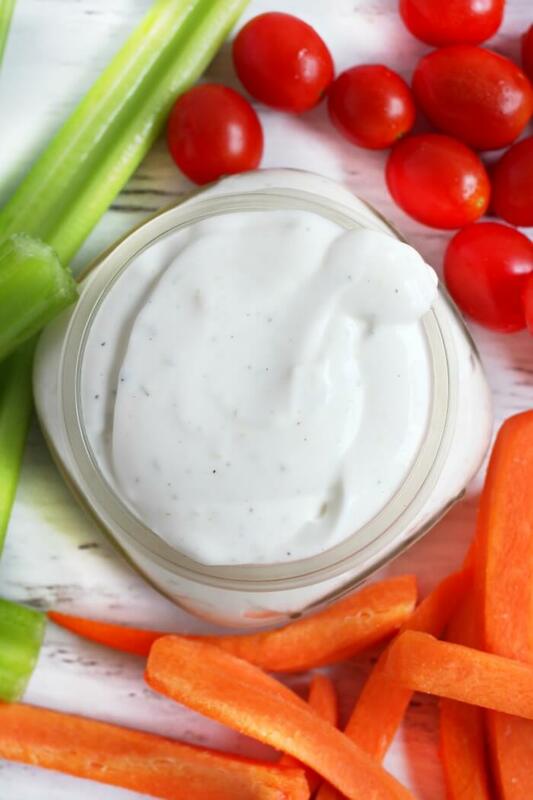 For the thickest ranch dressing make sure to always use full fat ingredients as low fat and fat free mayonnaise and sour cream tend to be runnier in texture. Homemade Ranch Dressing can be kept in the refrigerator for as long as 3 – 4 weeks. Check the labels on your individual ingredients to confirm how long they are good. Your dressing will expire when the earliest ingredient expires. Do not leave at room temperature and always store in a sealed air tight container. 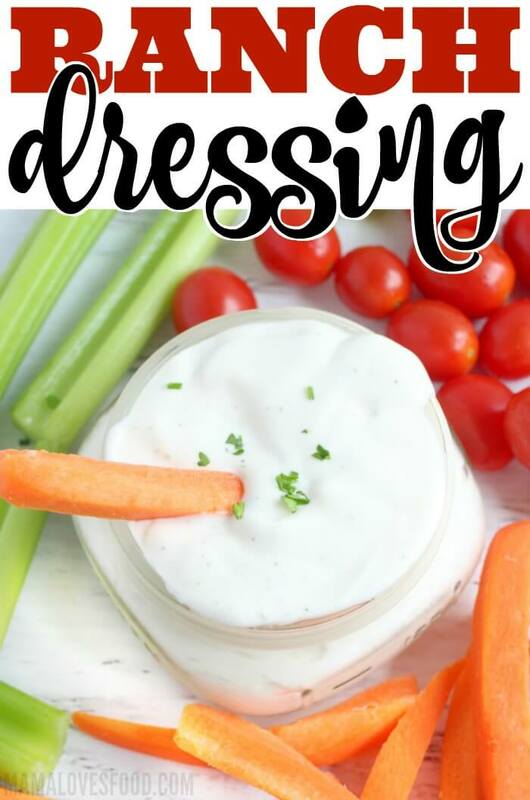 You can freeze ranch dressing, but because of the dairy (which doesn’t freeze well), the thawed dressing will not be as delicious and may have separated or have a gritty texture. I recommend you just make as needed. The exception is that you CAN freeze the buttermilk for use in the recipe as needed. Freezing the buttermilk in 1/2 cup measures (in a glass ball jar with head-space) will make creating this recipe as needed a breeze. 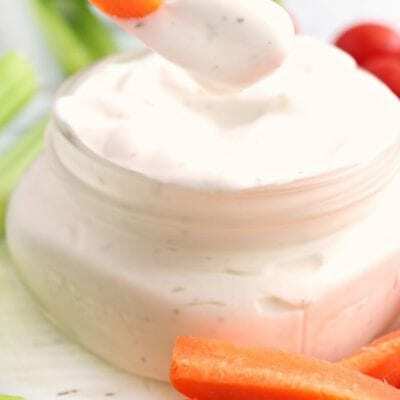 Ranch dressing can be heated in the microwave and mixed with vegetables or salads. It is not safe to warm it by leaving at room temperature though! Always keep unused dressing refrigerated. Dogs should not eat ranch dressing due to the garlic and onion in the recipe. A small amount can give them an upset stomach, and a large amount could cause more serious distress. Buttermilk dressing is not the same; most ranch dressing recipes have some buttermilk added, but the taste is changed by the herbs and spices that are combined into the recipe. For my food geek friends, Ranch dressing is a subset of buttermilk dressing. Class dismissed. This comes together so easily and will quickly become a family favorite. You’ll never buy the bottled version again! 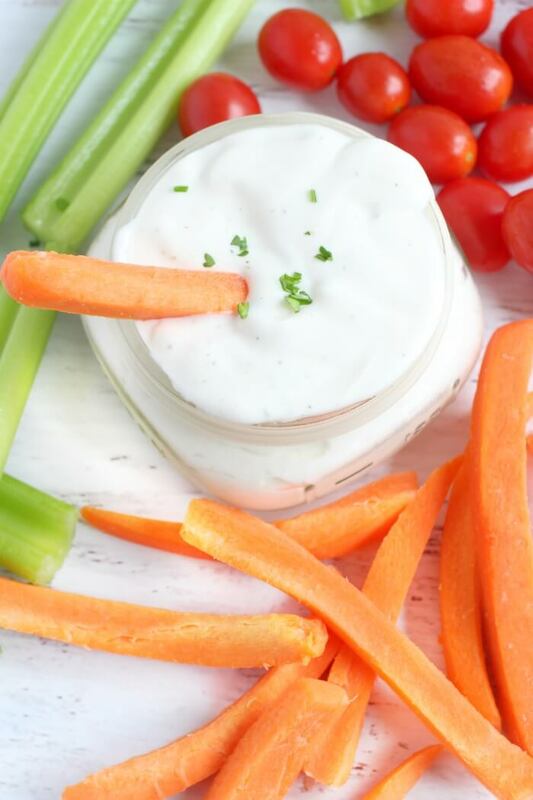 Ranch dressing is so easy to make from home with this simple recipe! 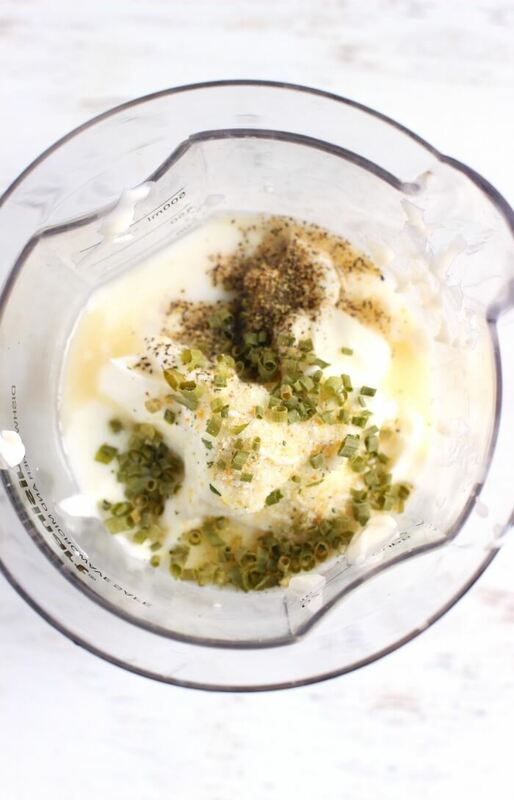 Combine ingredients in a food processor or blender (I use my immersion blender) and blend well. « Cheeseburger Soup – Easy and Delicious! Mmmmm! I just made this!!! It's better than I imagined! Thanks for taking the time to post all these wonderful recipes!! 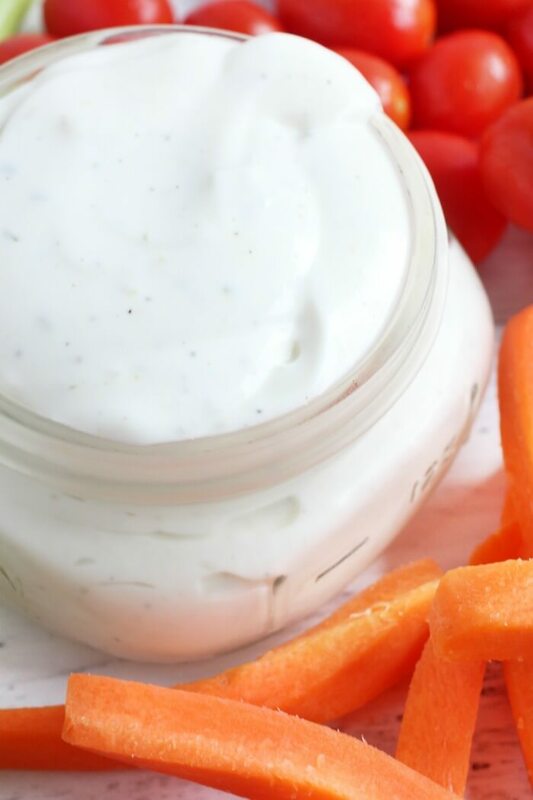 I always make my own salad dressings and dips and I love buttermilk, so this and all the rest are definitely going to be added to my list of yumos! I made this ranch tonight. I found the garlic salt to be just a tad salty for me personally. I plan to use garlic powder next time. I also found that for my preference it needed more garlic and chives. I also added a little dill. This was a good base and with a few tweaks pretty tasty. I haven’t found a homemade that beats the hidden valley buttermilk packet yet. I am still on the lookout for a homemade version! Thanks for posting!!! This dressing is a thousand times better than anything you can buy at the store! Every salad deserves to be drizzled with this. I am always searching for a good Ranch Dressing. Its the go-to-dressing around the house. Will totally give this a try and see what the troops think.